This is a post I’ve reclaimed from the archives; something I want to do regularly on Wednesdays. Archives meaning something I did so long ago that few ever saw it but me! I made this spaghetti carbonara for dinner this past week and am always amazed at how much I love this dish with such simple ingredients; it has long been a favorite of mine. I remember making it for my family when Ias barely in my teens and nothing has really changed, well not much has changed at least. I don’t think I ever had anything but Parmesan from a green can growing up; didn’t even know it existed as a real block of cheese (but then also didn’t know about butter; we had margarine, nothing else!) so that update over the years has been all that is necessary. The addition of good Parmigiano Reggiano does take it to a whole new and delicious level. Don’t be fooled by recipes that add cream; that’s someone’s version of a spaghetti dish but this my friends, this is Spaghetti Carbonara! It’s easy and it’s SO good. Enjoy! P.S. After sending out this post, I heard from a reader who left a sweet comment and her recipe for Carbonara. I hope you will take a look; it’s not just about the recipe but it’s a story of the Allied liberation of Rome and if you are a proud American like I am…well, it made me get a bit teary; that photo of the elderly woman kissing a GI? See if you don’t feel the same. My Dad was a fighter pilot in WWII and is still alive at 92; this so touched my heart. Thank you Adri…you have given this post so much more meaning and I thank you for that! Simple and delicious; this blend of spaghetti eggs and bacon works for any meal of the day! Although I'm a pill about the ingredients that make the sauce, it's pretty open to interpretation what ingredients to add. I will sometimes include either garlic or white wine even thought that is not considered 'traditional.' What is absolute? Spaghetti, eggs, pork, pasta, Parmesan and pepper! Cook spaghetti according to package directions. Since I used angel hair I had taken some steps prior to cooking my pasta since it cooks in 3-4 minutes. Regular spaghetti will take more like 9-10 minutes; plenty of time for you to start preparing the dish after you start your water to boil. Cut the bacon into pieces about 1/2 inch wide. Cook in a skillet until the bacon is just beginning to get crisp; add the chopped garlic and wine and cook for a minute or two longer. Remove from heat. When your pasta has finished cooking, add the pasta and the bacon mixture to the eggs in the serving bowl and mix thoroughly; the heat from the pasta will cook the eggs; add 1/4 to 1/2 cup of pasta water, just enough to create a sauce. Add the Parmesan cheese, mix lightly and serve. Sprinkle additional cheese on each serving, grate fresh black pepper on top. Barbera, Italy’s third most planted grape, is a great match for Spaghetti Carbonara. The low-tannin, high acid level of this lighter-bodied red wine can cut through the richness that the dish has and stand up to the smoky bacon flavor, without overpowering it. The 2007 Fontanafredda Barbera d’Alba Briccotondo from Italy’s Piedmont region has been raved about and can be found in many wine shops across the US. Such a classic and so worth pulling out from the archives! I could eat this every day and never grow tired of it. I love carbonara. My daughter loves this dish and it’s never been a favorite of mine. Maybe I’ve never made it right. I’ll give it another try. I haven’t eaten it in years. It looks wonderful. This is one of Ron’s favourite dishes, he loves it with an appetizer of fresh mussels! Yours looks lovely Barb. Off to check out Adri’s recipe and story. I love Carbonara! Yet I never think to make it, great recipe. Thanks for the reminder! It’s so easy Jayne…you must make it! I love carbonara. I love pasta. I love bacon and eggs. When I make this I eat a lot. This is so good! I’m so with you Abbe…craving some more right now; think it’s great for breakfast too! I’m a total pasta fiend and this sounds just fantastic! I adore carbonara and I’m definitely going to give yours a try. This recipe comes at the perfect time because this evening I was just starting to plan my menu for the week ahead. 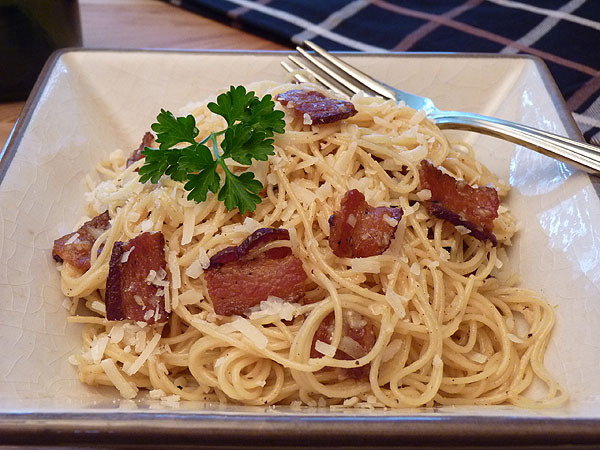 I love Carbonara – what a simple and lovely dish. It is, as the saying goes, greater than the sum of its parts. I think bringing back old posts is a brilliant idea! When I was growing up it was also green can Parmesan, and all margarine all the time. Truly good stuff! 😉 This is pretty much how I make it too. And you’re right that if you add cream, it isn’t Spaghetti Carbonara. Amazing how much we share! St. Louis, Parm, margarine and booze! Perfect Aby…I love it most with pancetta but that day only had bacon. Boo hoo. True, true…. your recipe is just how i make mine too! It’s so simple I wonder why people muck it up with other ingredients…this is pretty basic but also pretty doggone good! Bacon…. in carbonara is superb! And a good idea to revisit the treasures of old and share them with us. I love the simplicity of a cabonara and its a great one to ‘teach’ kids about creamy versus scrambled eggs. I have SO many of my favorites I did first…all of them just languishing in the forgotten land of early 2000’s. Guess that needs to change huh? Fabulous and simple. My gramma never used the wine… not sure why. I remember her adding some stock.. and she’d add some chopped hard boiled eggs…. something my grandfather enjoyed with it. I might have started with stock…but boy I sure do love it with the wine! Graci!!! I love all authentic recipes for SC with eggs and pancetta!!! More chesse!!! Thank you!!! Can you believe I have never had this. But I sure want some right now for breakfast. So easy, I gotta try it! I must say, I’ve probably had it for breakfast! Leftovers are the best if you ask me. Another very simple favorite of mine is Spaghetti Aglio e Olio. So simple, minutes to make and it’s always so good! Gosh, this looks so tasty! I love me some bacon! That looks amazing! I’ve never made that dish before, but it’s on my lengthy list of dishes to make sometime this year. Can’t go wrong with any dish that includes bacon… yummmmm! OMG – that looks sooo yummy! Where is my bookmark button…oh, there it is. On the list to try. Will let you know how it turns out. I like the simplicity but it includes my favorite things, pasta and bacon! I know it’s a late reply BUT it is so yummy and even better? So easy. I call it bacon and eggs pasta…it’s what’s for dinner!